As a result of the recent splits of some of Australia’s western specialties, Bellbird Birding Tours ran its second Western SA Specialties and Splits Tour. Starting in and returning to Adelaide, this tour traversed much of South Australia’s West Coast, the northern Eyre Peninsula and the infamous Nullarbor Plain to focus on the main targets of Copperback and Nullarbor Quail-thrush, Naretha Blue Bonnet, Western Grasswren and White-bellied Whipbird. Other species we targeted during the trip included Blue-breasted Fairywren, Western Yellow Robin, Rufous Treecreeper, Rock Parrot and Slender-billed Thornbill. The tour was run during the Austral autumn, a great time to go birding in this part of the world. The weather was mild, calm and dry and the birds cooperative. Focusing on quality, not quantity, all targets were seen and a total of 141 species was achieved. Mostly a driving day as we headed north from Adelaide, making stops at Pt Wakefield to find Peregrine Falcon, Black Falcon and Black-tailed Native Hens. Following the coastal mudflats and mangroves we had a huge flock of Slender- billed Thornbills, while the Arid Lands Botanical Gardens in Port Augusta yielded Redthroat, Chirruping Wedgebill and White-fronted Honeyeater. We had an enjoyable dinner at the Kimba Hotel. Found us at Lake Gilles Conservation Park at dawn, where Blue-breasted Fairy-wren, Rufous Treecreeper, Western Yellow Robin and the western race of Gilbert’s Whistler performed well. Not long after this bird bonanza we laid our eyes on a beautiful pair of Copperback Quail-thrush foraging quietly on the ground. We headed south, crossing the Eyre Peninsula, until we reached the fishing town and sea-food capital of Australia, Port Lincoln. We only had one chance at the very recently split White-bellied Whipbird which inhabits the dense coastal scrub of Port Lincoln National Park. At sunrise, we were at the stake-out for this species, and heard a number of them singing around us in the dense vegetation. Getting views of them was difficult, but our patience paid off after more than 2 hours of peering into dense bushes where a pair was singing at close range…They finally afforded everyone views. High fives all around! We spent the rest of the morning exploring this magnificent coastal national park with great views of Rock Parrots on multiple occasions, and further sightings of Western Yellow Robin, Blue-breasted Fairy-wren and the brown (intermedia) subspecies of Grey Currawong. Other good species seen here included White-bellied Sea-eagle, Black-faced Cormorant and Purple-gaped Honeyeater. We then headed along the west coast to Ceduna and saw a Southern Fiddler Ray from a mangrove boardwalk. An excellent seafood dinner was enjoyed by all in Ceduna. Up very early to try and beat a predicted weather change. We arrived at the Nullarbor Roadhouse at 8am and were soon on to Rufous Fieldwren, White-winged Fairywren, Red-capped Robin and our target: Nullarbor Quail-thrush. At first a pair was spotted, we then slowly drove the tracks and saw more, counting a total of 10! We then headed to a spot west of Nullarbor and secured Crested Bellbird, Grey Butcherbird, Horsfield’s Bronze Cuckoo, Mulga Parrot and after some searching we came across a pair of our target Naretha Bluebonnet. They provided extended, photographic views. A celebratory dinner was had back at the Nullarbor roadhouse! The predicted weather change had fizzled out, leaving some rain showers overnight, followed by another beautiful morning. Another drive around the local bush tracks yielded 10 Nullabor Quail-thrushes once again, then we started the return journey. We checked the dramatic scenery of the Head of the Bight but were just a couple of days too early for the annual arrival of Southern Right Whales. Australasian Gannets were seen flying over sea while Sooty Oystercatchers foraged on the rocks below the spectacular cliff-top lookouts. For the night we ended up in the farming township of Minnipa at the base of the Gawler Ranges. Having seen all targets except Western Grasswren at this stage, we decided to explore the Gawler Ranges. A little-known yet beautiful range reminiscent of the Flinders Ranges, we started off with a sunrise visit to the amazing Pildappa rock which rivals Wave Rock in WA, before heading further across the hills and ranges. A short walk to organ-pipe-like rock formations resulted in extraordinarily good views of Shy Heathwrens; the rolling hills and ranges were covered in the first flowering bushes and flushes of green cool-weather growth; Mulga Parrots were observed feeding at close range and the highlight of the day was no doubt multiple sightings of Elegant Parrots. At the end of the day we emerged from the hills and descended down to the coast yet again, to stay at Whyalla. Before we got there, however, we had our first views of our last target: Western Grasswren. A fresh morning greeted us out in the field looking for Western Grasswren. Having had brief views yesterday afternoon, the birds took some time but eventually everyone had had good views at some stage during the search. Other birds we came across included Southern Whiteface, Slender-billed Thornbill, Crested Bellbird, Splendid Fairy-wren (Turquoise race) and Redthroat. A final, scrumptious lunch was had at the Arid Lands Botanical Gardens in Port Augusta, before we headed back to Adelaide, picking up Banded Stilt along the way. All targets seen, and well; and everyone agreed it had been another great Bellbird Birding Tour! 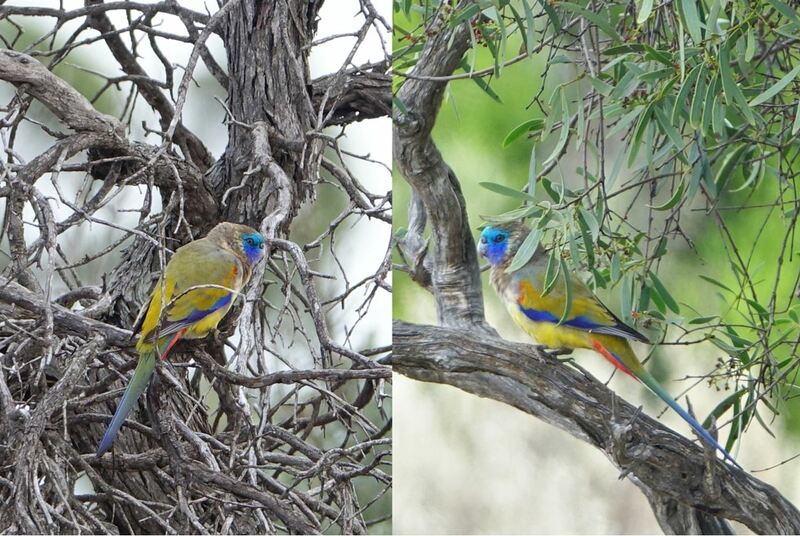 This entry was posted in Birding Reports, Highlights of South Australia. Bookmark the permalink.